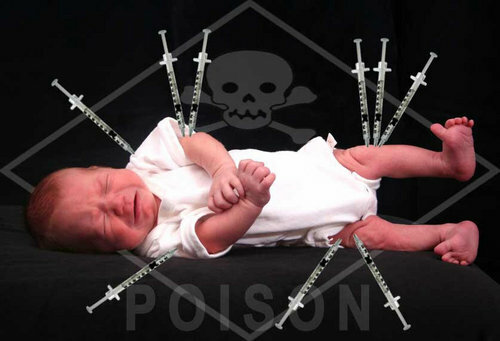 How many things could a child find wrong in this vaccine picture? Recently, an advisory panel to the Centers for Disease Control unanimously voted to mandate vaccines for all those over six months of age. The H1N1 vaccines are not “just like regular flu vaccines” as the government insists, but contain nanoparticles, making them highly experimental. Mandating their use means forcing people into a medical experiment in violation of the Nuremberg Code. And now the untested H1N1 vaccines with their toxic ingredients have been combined with regular flu vaccine, making it impossible for people to get only a normal flu vaccine and creating the likelihood that millions will take it without realizing. This is occurring against a background in which CBS proved that the CDC had lied about the cases of swine flu in the US, which were insignificant. Yet two days after the CDC was exposed for putting out false numbers, Obama declared a national emergency, which activated FEMA, removed Americans’ rights, and negated all requirements for testing of the vaccines. Now the H1N1 pandemic itself has been exposed by the EU parliament as a kickback scheme between the WHO and the pharmaceutical industry. And yet Sibelius at HHS has quietly extended the “H1N1 pandemic” (in essence only a corrupt financial scheme) until 2012. Though making no medical sense, this leaves US Northcom on the ground (a first in US history) for a flu (that is barely more than a cold) and continues Obama’s false national emergency, including no requirements for testing the vaccines. In the midst of this potentially deadly and increasingly suspect situation with vaccines, the FDA has gone even further and quietly made two significantly threatening vaccine-related legal moves of its own. “This past spring, the FDA took a hands-off approach to Merck’s admission that DNA from a lethal pig virus is contaminating doses of RotaTeq vaccine being swallowed by millions of newborn babies…. “Last year when federal health officials declared a pandemic H1N1 “swine flu” national emergency, drug companies put a full court press on the FDA to fast track licensure of highly reactive oil based squalene adjuvants and the use of new technology, like insect cells, to make pandemic influenza vaccines. … [S]qualene adjuvants … hyperstimulate the immune system and have been associated with autoimmunity … [and] could be contaminated with insect viruses. The most significant item: The CDC just voted that every single person in the country over the age of six months should take the suspect H1N1 flu vaccine. What science is behind this? Precious little. What connections? Large ones. Were the vaccines to be mandated, the US would be violating the Nuremberg Code, which was created after WWII to prevent a repeat of the pharmaceutical industry’s hideous forced medical experiments under Hitler, for whom they were the primary support. Now, that very same industry, previously convicted by the Nuremberg Tribunal of medical war crimes including killing people with vaccines, is powerful at the CDC. Through the CDC, the vaccine industry is promoting the H1N1 vaccine for every person in the country over 6 months. just as last year the CEOs of the drug companies voted in Geneva at a WHO meeting to make the H1N1 vaccines mandatory worldwide. The pharmaceutical industry would be reclaiming power to perform forced medical experiments, this time on 350 million non-informed, non-consenting American subjects of all ages. In pushing for mandatory vaccination, the industry is attempting to wrench itself free from the fundamental human rights which the Nuremberg Code brought the world, and to break free from morality itself. Not unlike Goldman Sachs with everyone’s money and BP in the Gulf of Mexico, the industry wants profits and to do literally whatever it wants in the process, no matter the dire consequences to the human beings (or other living things). The pharmaceutical industry wants to be able to put anything whatever into any vaccine, with no testing, and force it on every person in the country agains their will. And last year, they came perilously came close to doing just that, mixing a bioweapon (avian flu) into a normal flu vaccine, and then falsely labeling it a “seasonal flu vaccine.” People taking it would not have known what they were taking and so would be exposing themselves to possible death, against their will. “If not discovered by a mid-level technician, many of the people immunized with the Baxter vaccine might have been infected with avian flu, which can be deadly. “But it’s worse than that. Yet, the current H1N1 vaccine mixes three animal viruses with a highly contagious flu virus, and also risks mutating. One does not need to consider the genocidal Nazi histories of these companies to be concerned. One need only see what Baxter did only last year (and that WHO doing nothing about it) or know that Pfizer recently received the largest criminal fine in history for “fraudulent marketing of drugs” (but one of their crimes), to consider that the pharmaceutical companies involved in the vaccines leave something significant to be desired ethically and morally. The vaccine pictures contains so many things wrong, that like a child spotting hidden things in a drawing, one need only look carefully to see them begin to reveal themselves, until one wonders how they could have been missed in the first place. And they become easier and easier to spot since very single one of those wrong things faces in one direction – untold billions in profit for one of the largest and most corrupt industries in the world, and danger, disability and even death for the public. This entry was posted in Big Pharma, Bioweaponry, FDA, USDA, Genetic Engineering, Guest Blogger, Healthcare, Human Rights Civil Liberties, Swine Flu H1N1 and tagged baxter, Big Pharma, CDC thugs, forced vaccines, medical experiment, Nano Vaccine, Nuremberg Code, Pfizer. Bookmark the permalink. In the picture, those are insulin syringes, not tuberculin syringes that we give vaccinations in. Why would you inject a baby with insulin? Your pretty sick.